Hooray! I am finally blogging on this website and I'm starting it off with a few images from the most wonderful hour spent back in March with my friend, Anna. I've been on the pursuit to photograph women in their space, doing things they enjoy. Specifically I'd like to capture women in their 20's. Anna very graciously allowed me an hour of her time as she practiced her Aerial Arts technique at the old Ninjaplex location in Greenville, South Carolina. Anna is part of a local cirkus group known as TimTV & The Secret Cirkus. The "cirkus" comes from a collection and focus on circus sideshow skills, fire arts, vaudeville, and burlesque acts. 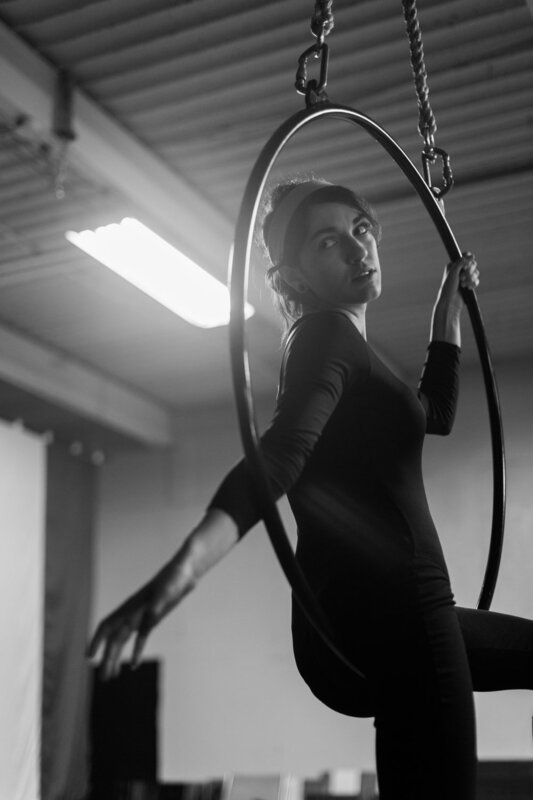 After speaking with Anna it was clear that she dove into aerial out of a need to conquer past fears and found such a rush from it that she has continued the practice it for the past year now. Watching Anna and seeing her confidence made me want to hit some of my own fears head on this year and I hope to do so. Rambles and jabbers of Ginia Worrell in Pickens County of South Carolina.